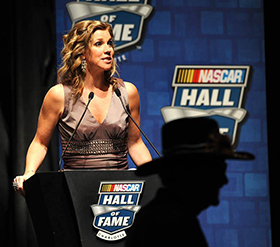 NASCAR on FOX host/reporter Krista Voda returns in 2014 to co-host the NASCAR Hall of Fame Induction Ceremony alongside Mike Joy on Jan. 29. FOX Sports 1 carries live coverage of the Hall of Fame Induction Ceremony from Charlotte, N.C., beginning at 7:00 PM ET. The duo has hosted the ceremony since the inaugural class of 2010 was enshrined. Voda interviews the newest Hall of Fame class members moments after their induction. “Every year, I walk out of the Hall of Fame Induction Ceremony with a greater respect for the history of our sport,” Voda said. “It is such an honor to be the first person to talk with each gentleman and/or representative of his family as they walk off the stage following one of the most special moments in each individual's career." Additionally, Voda again emcees the NASCAR Hall of Fame dinner honoring the inductees preceding the Induction Ceremony. Once NASCAR Hall of Fame duties wrap up, she turns her attention to her role as a NASCAR on FOX pit reporter and host of NCWTS SETUP on FOX Sports 1 at Daytona Speedweeks, which kick off on Thursday, Feb. 13.